The Deadlift is arguably the rawest of the raw when it comes to the big three of power lifting. The Bench Press reigns supreme when it comes to training the upper body. The Squat is master all mighty when it comes to building your lower body. The Deadlift however combines the best of both worlds. The Deadlift is the one exercise that works the hamstrings, glutes, lower back, lats, traps, shoulders, chest, abs, hips, and quads in one swoop. That is a lot of bang for your buck! Of course anything that works that many muscles at once is no walk in the park. It’s no wonder the Deadlift is one of the most loved and most hated exercises of all time. If you love the Deadlift or you’re a Power lifter you have one goal…increasing your pull poundage. To pull massive amounts of weight, you have to generate massive amounts of force. 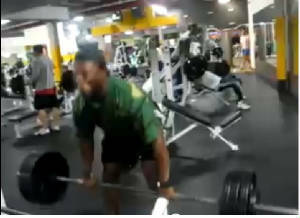 The Deadlift is also unique to his “Big Three” brethren because that force has to be generated from the very beginning of the lift. On both the squat and bench press there is an eccentric/concentric chain of energy (sort of like a pull in of energy and recoil of that energy on the upwards motions of both lifts) built while performing the lift. The Deadlift however only has a concentric pull. Because the Deadlift is concentric and not eccentric/concentric this is where the need for great force comes in. Andy Bolton deadlifting over 1000 pounds!!!! Let’s go back to high school math for a minute. Here is a formula some of you may or may not remember. Force=Mass*Acceleration or the faster you pull your deadlift the more force you can produce. So now that we know the amount of force you pull with is directly related to speed, how do we build up speed? We can build up speed in a few ways. The two mains ways we are going to look at are 1. thru range of motion training and 2. thru speed pulls. Range of motion training is pulling a deadlift thru an extended range of motion. By doing this your body gets used to producing enough force to pull the weight thru an extended range. Once you return to a normal range of motion for pulling the deadlift, the pull becomes easier because the range of motion you have become accustom to pulling thru has shortened. This is usually done by practicing pulling your deadlift from a deficit. A lifter will elevate him or herself of the ground at a deficit from anywhere from 1-6 inches. This can be done with weights, aerobic steps, a box, or any type of support that can hold the weight. Speed Pulls are exactly as they sound like. The object is to take a weight and pull it up as fast as you can in good form. Unlike the deadlift from a deficit you start your pull like you would a normal deadlift. The key however to the pull is the amount of speed generated behind it. Generate enough speed when pulling and you will produce great force!!! Now we have a basic understanding of two types of methods for improving your pull speed. The question is how do we make them work? The first thing to understand is we are typing to build up pulling speed. When training for speed you want to train in a weight range that will allow you to pull a weight with enough speed that produces a good amount of force. Remember the formula (F=M*A). Usually a range of 50-60 percent of your one rep max will allow this. Ranges higher than this start to stress the nervous system too much and the balance between pulling the weight with enough speed is thrown off. We understand that speed pulls help with building pulling speed in theory. The problem is if you’re a puller that has trouble at the bottom of your pull even by speed pulling you may not generate the force from the start that you may need. This is sometimes helped with banded speed pulls, but that’s another article for another time. We also understand that pulling from a deficit will help you build up more force for pulling thru an extended range of motion in theory. The problem here is somewhat opposite of the speed pulls, a lot more force but not much pulling speed. So what is the solution? A combination of the two elements is the answer. Training in a situation where you’re sure to get the most benefits from speed and force. 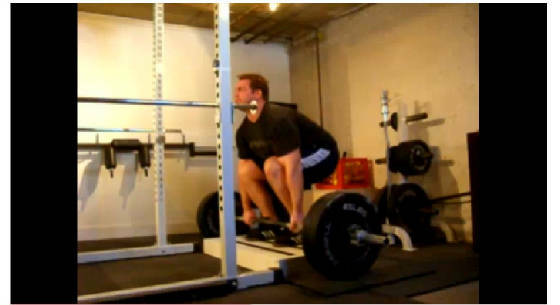 The exercise you seek is the speed pull off of a box or as I like to call it the “Elevated Speed Deadlift” By combining these two methods of speed training you prepare your body to build some good speed and the deficit primes the nervous system to generate great force when you return to normal dead lifting. You do not necessarily have to use a box but any strong support will do. Only elevate as much as you can without losing neutral spine. More than 4-6 inches isn't going to happen. Due to the fact that pulling from an elevated position is harder than normal deadlift pulling for speed should use a slightly lower max pull percentage. Aim to work in the 45-55 percent of your max lift range. From the elevation the key is to pull with speed but most importantly pull with good form. If you have to sacrifice form to make the lift slightly drop the weight till you can speed pull with proper form. Setting up the "Elevated Speed Deadlift"
Now that you have the exercise, you’re probably wondering how to train it. If you’re training for power then most likely you have a day in your workout schedule during the week for speed work. You should do your Elevated Speed Deads on this day. The cycle should last for three weeks. You want to increase your elevation two inches each week while still trying to pull as fast as you can. You will be doing 9 sets of pulls for 3 reps each. The first 8 sets you will be pulling from the elevated position. The very last set you will be pulling from the ground (normal deadlift position). After three weeks of this movement you should notice great explosion in your deadlift. You also want to switch to another type of speed work for a few weeks and then you can go back to the “Elevated Speed Deadlift”.